I thought I would post my recipe for Boozy Apricot Fool, as it went down so well with everybody at the weekend. It’s not that cheap to make I suppose, and very calorific, but you have to push the boat out a bit when you are entertaining. You can substitute the wine for fruit juice if you prefer. Soak your dried apricots overnight in the wine or juice, then simmer them gently in a covered pan for about 15-20 minutes (less time if they are pre-soaked). Let it cool, then zap to a puree in the blender. 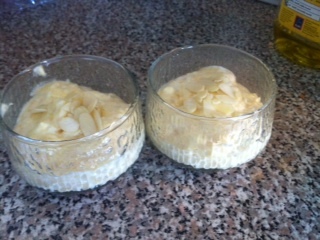 Whisk the egg whites until they are stiff, then add the sugar and whisk a bit more. Combine your ingredients, folding in the cream and lemon juice. Spoon the mixture into 4 nice glass dishes (mine are in 1970s freebies from the petrol station – if you are a certain age you will recognise them!). Sprinkle with flaked almonds and chill in the fridge for at least 3 hours. This delicious apricot fool is one of my favourite naughty puddings! Your living room is lovely… looks peaceful and pleasant… and the recipe sounds delicious!